Cantilever rolling ladders are great for accessing mezzanines, over office storage or anywhere a standard rolling ladder cannot reach. Standard rolling ladders are not designed to access areas where there is not enough room or “kick out space” for the base of the ladder. Ladders are not straight up and down they are tapered inward about 5/8” per step. Example: If you push a standard 10 step (100”H) ladder against a wall the top platform would be 6 ¼” from the wall ((10X5)/8=6.25). 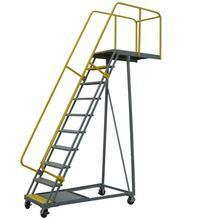 Using a cantilever ladder you would be over the platform by 14”. Add the optional top chain in lieu of top bar (Model PW-CL-CHAIN) and you will be able to access the mezzanine, loft or over office storage area safely. Custom units are available. Please call ZORIN to discuss (888) 378-6525.